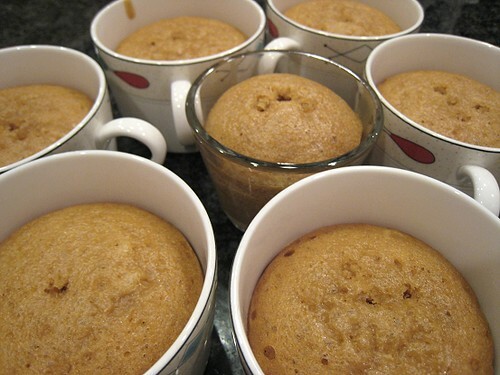 Oh, I believe the Rekados site still has a picture of the "warm toffee cake" (to mock us!). It's the final picture in their Gallery section. 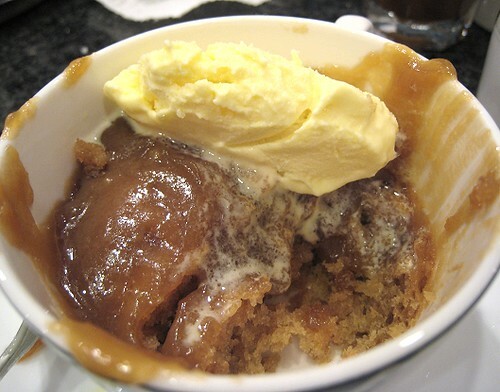 They serve theirs warm inside a coffee cup (or ramekin) with the sauce and ice cream on top. We were thinking of the type of cake it is, and JS settled on it being like "ma lai kuh" (Malay Cake). The ma lai kuh we're used to seeing are the ones in dimsum. They're really high and fluffy, and could be anywhere from pale yellow to a taupe-ish color. Rekados' "warm toffee cake" leaned towards the taupe end, I believe. There were lots of recipes for ma lai kuh online. After looking through a number of them and judging by the pictures of the finished product, most ma lai kuh were too pale and seemed to have a more "cake-y" crumb (for lack of a better word) than what we were looking for. I finally settled on basing ours on this recipe by Big Boys Oven. Unlike other recipes, this had a darker hue. As for the crumb, I could only hope for the best. I don't remember if the Rekados menu specified a "toffee" sauce or a "butterscotch" sauce. I looked up the difference between the two in my trusty Food Lover's Companion. So, butterscotch it must be! For the recipe, I looked through our America's Test Kitchen and How To Cook Everything cookbooks. I finally decided on Bittman's since it basically was a dump-into-a-pot thing (whereas the America's Test Kitchen recipe called for making the caramel first). Look, a recipe using weight (not volume)! I had to whip out the seldom-used ghetto kitchen scale of ours. In the scale above was 150 grams of all-purpose flour and 10 grams of cornstarch. 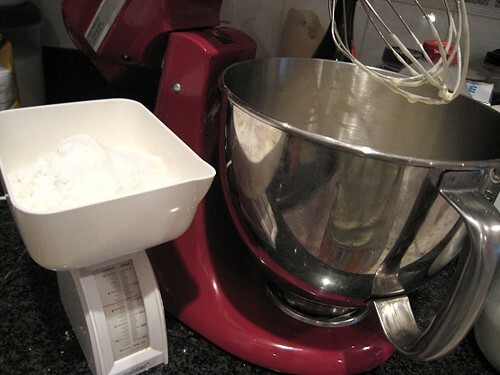 The recipe called for 160 grams of cake flour, but I didn't have that. I believe AP flour + cornstarch is a substitution I learned from our America's Test Kitchen cookbook. I'm not sure if it's the exact subsitution, but I figured it should be OK. 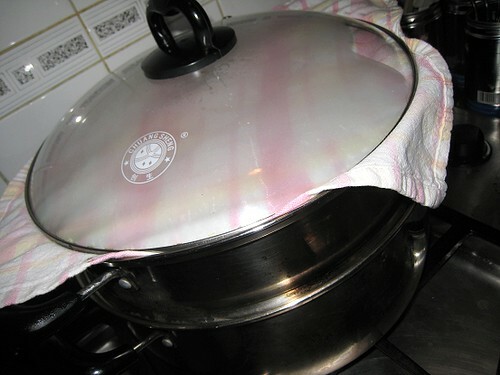 In with the flour was 1 tablespoon of baking soda. I read it twice to make sure it's soda, not baking powder. ...then added 100 grams of sugar (I took castor sugar to mean regular white sugar). I whipped until thick and white. I added the flour + baking soda to the eggs, then 70 mL of brown sugar (I didn't use palm sugar as per the recipe) and 200 mL coconut milk. 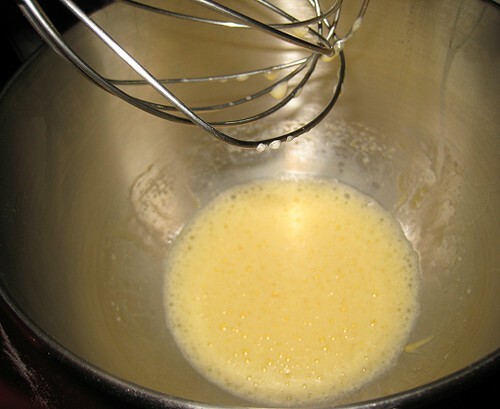 I then let the mixture rest for about 20 minutes. Unfortunately, I don't have a shot of the rested batter. Its texture was only apparent as I poured it out of the bowl. It was foamy and had quite an "elastic" consistency... perhaps a texture like a bread starter? 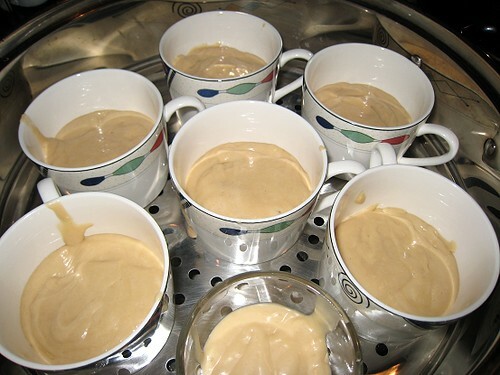 Here they are in cups, ready for steaming. 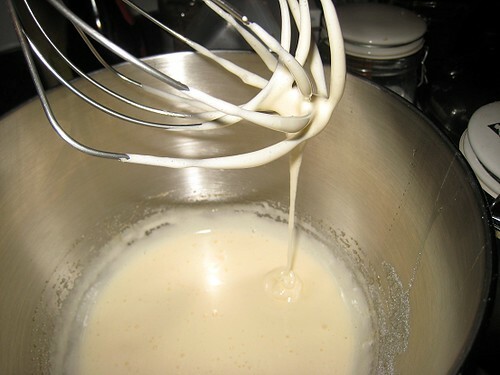 While the cakes were steaming, I went to work on the butterscotch sauce. 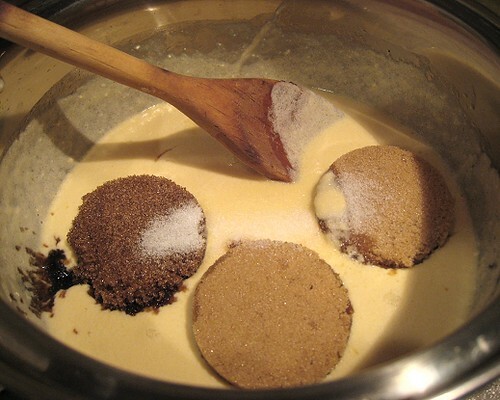 I believe Bitman's recipe called for 6 tablespoons of butter, 3/4 cup of brown sugar, and... I forget how much cream. I guess about one cup. I didn't actually have cream on hand, so I used canned Nestlé cream instead (gasp!). It was one small can. I don't think it made much of a difference. 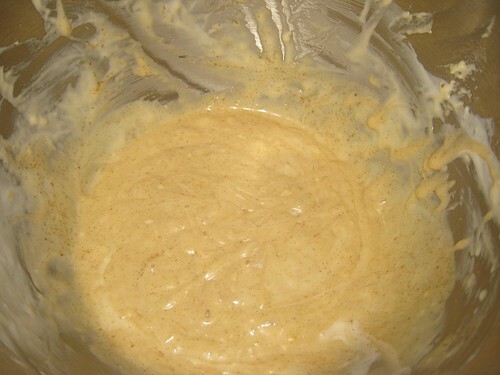 For the brown sugar, I used 2 parts light brown sugar and 1 part demerara sugar. Bitman called for a "pinch" of salt, but since what I liked about Rekados' "warm toffee cake" was the play between sweet and salty, I added a whole teaspoon of salt. After a bit, the cakes were ready! Those holes are from my gratuitous pokings to test for doneness. They're big because I used a wooden chopstick instead of a toothpick. But, I was also thinking ahead, see. I wanted the cakes be even more porous so the butterscotch sauce can soak right on through. The finished product, half-eaten, as the mouth was faster than the camera. This is actually the second time we attempted a "ma lai kuh," in the hopes of replicating that precious, precious warm toffee cake of Rekados. The first time was ages ago (six to eight months ago). If I remember correctly, it had a tighter crumb and it was not as soft and moist as this second time. For me, this second attempt is closer to our goal: crumb is just right. The only thing was that it was SO BITTER when eaten by itself. 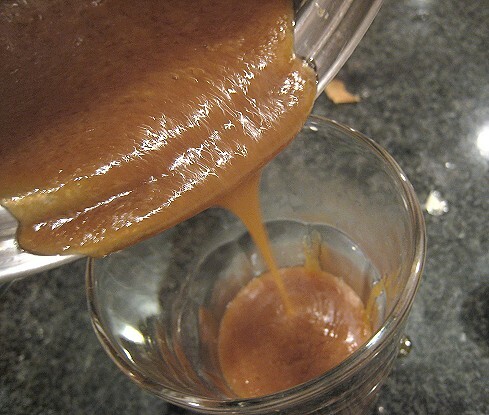 Regarding the butterscotch sauce, I would like it to be thinner and smoother than the one we had this time. This is a good second try -- and I suspect our third time is going to be the charm. 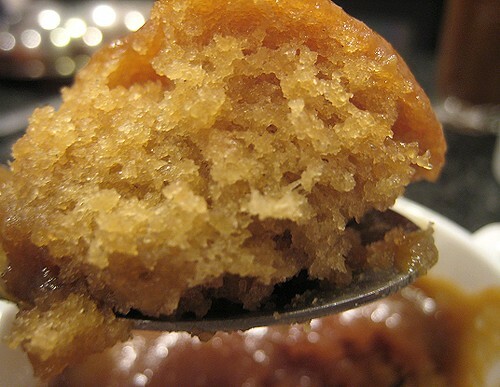 We might finally invest in those ramekins for this toffee cake. We served this with a crème brulée flavor gelato that was, of course, superdelicious. I believe the bitterness was from the baking soda. I wonder if using baking powder instead would eliminate that bitterness, since I usually see baking powder in larger quantities (than baking soda) in recipes. I just hope it doesn't mess with the crumb! The cake was BEYOND bitter, so one really had to eat it with the butterscotch sauce. I confess, the sauce may have been a tad too salty, because I added a second teaspoon of salt to the mix while it was heating. I won't do that next time. It wasn't unbearably salty, but I think cutting back a little would be better. And I guess more cream will make it thinner? Of course, how can there be anything wrong with that gelato! Impossible! Teehee. This dessert really had to be eaten all together. The sweetness and saltiness of the butterscotch sauce hid the bitterness of the cake while the gelato mellowed out the whole affair with its coldness and melty-ness. Look at that perfect crumb! Hiya, great ma lai ko. I think the same as you that the bitterness might have been from the baking soda, try reducing the baking soda to hard teaspoon! Happy trying!